I sometimes Google a word or a phrase, just to see what the search engine algorithms is de facto defining it to be these days. USA Today even published an article once about the value in Googling yourself, but that’s a topic for a different post. 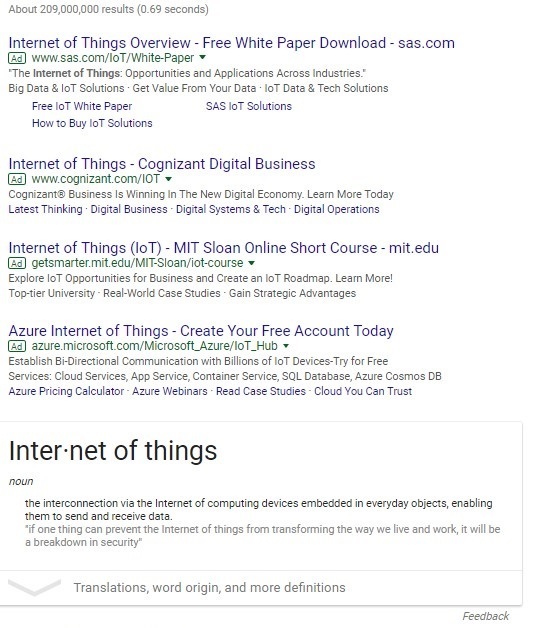 In any case, I decided recently to Google “internet of things” because for me, and potentially for a lot of people, the general definition was getting cloudy. It must be a challenge for those who have never really done any research on the topic to actually get to something useful in a search like this — only one of the articles on the first page of search results was from 2017. I am not disparaging Microsoft and MIT here. It’s just that for a topic like IoT, getting to valuable, actionable information on the topic may require a bit more context and clarity. Certainly, these search results did not provide that. So I wondered: If I only had 30 seconds to tell someone about the value of IoT, what would I say? What “elevator pitch” would I give to get that person to care about this latest technical evolution? I think I would ask this question: If you could know in advance that something you own, are responsible for or care about — an appliance, a car, an inventory of machines, a body part — was going to have problems, wouldn’t you want to know so that you could fix it? Well, to quote the oft-used but inaccurate Morpheus meme, “What if I told you that you COULD know?” That is the power of IoT — to allow things to “send and receive data,” but more critically, to know something new and valuable that could change a life for the better. It may be a stretch to say that knowing that my car battery needs to be replaced is the same as knowing when my drinking water has been contaminated. The technological advancements behind one does support the other though, and the use cases for the tech are only limited by our imagination. As Eric Schmidt of Google said in 2015, “Everyone gets smarter because of technology, and the empowerment of people is the secret to technological progress.” Many who read this site are already implementing complex advanced services like machine learning and artificial intelligence. But Cisco recently reported that almost 75% of IoT projects are failing, and I think that’s in part because those not “in the know” don’t get it. It is time for us to hone our elevator pitch — think of IoT as a startup and get really good at telling everyone we meet why what we’re doing matters. Tell them about the 200,000 babies that were saved, or the innovations in chemical-free water treatment. The data is out there, but not very easy to find for the average web searcher, so it is up to us to help — or the technology will take longer to “empower” the people and achieve lasting value.